Sicilian Sisters Grow Some Food: "The smell of new mown hay"
That's what my dad said every time he mowed our lawn. 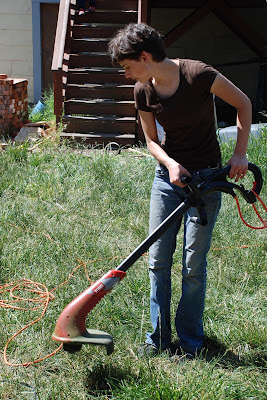 Since we were in Southern California, that lawn was probably Bermuda grass (my #1 garden menace) and it required a lot of sprinkler use. I remember lots of sprinkler repair! It was a good smell, one that I enjoyed even more when I lived in the southeast and we didn't have to water to have a green and springy yard. Of course, by then I was the mower and it wasn't as much fun. When we lived in Arizona, we didn't want to use precious water on a lawn, so our front yard closely mirrored the desert around us. It bloomed after winter rains and was cactus alone the rest of the year. I missed the green of the southeast then. Now that I'm back in a water-challenged area, I'm still focused on food production. I don't want to put in the work that grass requires. Fortunately, I have other labor for lawn care. Since that other labor insists that the bit of lawn we have is necessary for games, it stays, at least for now. Out front, though, in our "public" face, it's a different story. Both for aesthetic reasons -- I find food gardens really beautiful -- and for leading by example reasons, nearly all of our front yard is edibles. On the west side, persimmon and apricot trees, a future hedge of rasp-and blackberries, and currently a few different kinds of winter squash (and maybe a mistakenly-planted yellow crookneck). 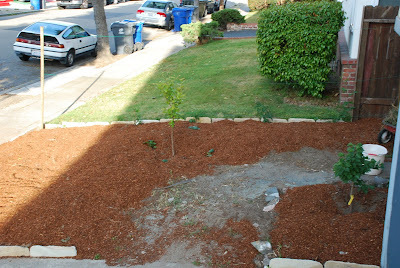 This side has more shade from the street tree, but we're thinking of judicious pruning to allow more light in. 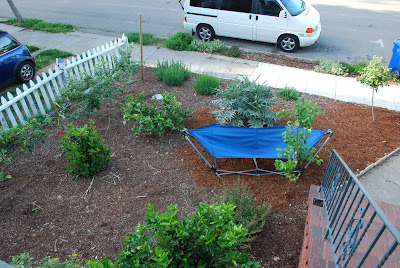 Maybe we'll put a herb hedge along the front edge, also. 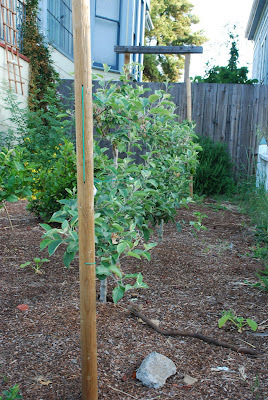 For now, though, this one's done except for watering and getting those young trees through their first couple of years. bay, rosemary, the artichokes of course, an apricot, a rose, lavender, two varieties of culinary sage, oregano (not the best cooking varieties, as they have insipid aroma and taste), wisteria, and some jasmine that smells terrific. Currently, there's also some pumpkins and cantaloupe, and I'd like to shoehorn in a few watermelon plants this year also. 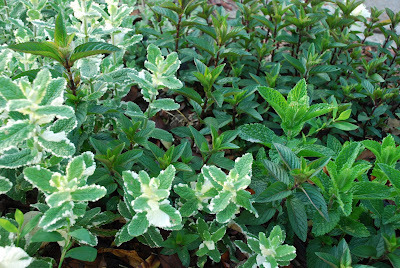 A wild mix of three different kinds of mint -- spearmint, variegated, and chocolate. The parkway edge along the sidewalk is the perfect place for such invasive varieties. I do, however, wash it well because of the interest shown in it by passing dogs. I love smelling it after we brush against it getting in the car. When I compare our yard with the lawn to the west, it feels much more alive, much more enticing. Passers-by comment on the plants, and people enjoy watching as the seasons change and pumpkins turn orange, artichokes flower, and the fruit trees bear. The back yard is the powerhouse of food production, but the front is the showpiece. And for me, what it shows is the beauty available when "out of the box" can help to fill the larder, too. Your yard is looking so beautiful! I love the idea of an ambassador front yard, smiling and inviting the neighbors to grow their own food. Oh how I *hate* Bermuda grass. If it weren't for the Bermuda, I wouldn't have much trouble keeping my garden weeded, but there's just no stopping the darned stuff from re-invading and it's hard as heck to completely remove. On top of that it makes for an ugly lawn that's not at all fun to walk on barefoot. Your yard is gorgeous! I agree, food gardens are beautiful and can definitely be out in public. Thanks, Susan. They probably feel more like your neighbor, though! Wait until I'm a cranky old lady chasing kids out of it. RL, I'm with you. Too bad it's not edible. And I don't even have kudzu. It's one of the few plants (spent the weekend attacking the neighbor's English Ivy) that I'm willing to consider herbicides. Gah. I hate it so. Dig, sift, dig, sift, repeat year after year. I have words for its importer. Thanks for your support. Your garden is an inspiration, more so because I know what kind of weather you're out in. Pretty soon you want have to shop for fruit or veggies. 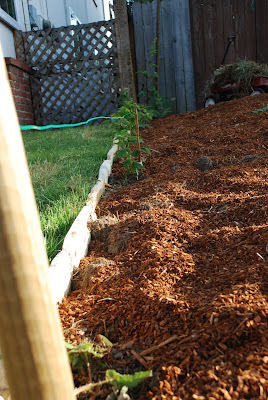 I see that the work party of teens cleared the left front yard and your berries are planted. I can't wait to taste them. Kristin, you've already got the mobile farm stand down! I hope we get enough of anything to share. Your garden is amazing! I actually found your blog while trying to look up the names to some these beautiful plants I see growing all around me. Do you know of any good resources for someone who's just getting started? Thanks!